Due to climate change, black vultures have spread northward in the last 35 years and now winter as far north as Massachusetts, where the minimum winter temperature is similar to what it was in Maryland in 1975. New research shows that climate change may have a negative effect on birds. A new study looked at 59 different North American species of birds and found that it took decades to fully adjust to the warming temperatures, if the birds adjusted at all. As warmer winter temperatures become more common, one way for some animals to adjust is to shift their ranges northward. But a new study of 59 North American bird species indicates that doing so is not easy or quick — it took about 35 years for many birds to move far enough north for winter temperatures to match where they historically lived. Earlier studies of responses to climate change examined shifts in species’ geographic ranges. “Our work adds important realism and a temporal dimension to these models for a critical aspect of climate: minimum winter temperature,” said co-author Walter Jetz of Yale University. The researchers used 35 years of data from the North American Christmas Bird Count to match winter temperatures to where birds were seen. They tested 59 bird species individually and found that they responded differently to climate change. When summarized across bird species, there was evidence for a strong delay lasting about 35 years. For example, black vultures have spread northward in the last 35 years and now winter as far north as Massachusetts, where the minimum winter temperature is similar to what it was in Maryland in 1975. On the other hand, the endangered red-cockaded woodpecker did not alter its range at all despite the warming trend, possibly because its very specific habitat requirements precluded a range shift. Both of these scenarios could represent problems for birds, La Sorte said. Species that do not track changes in climate may wind up at the limits of their physiological tolerance, or they may lose important habitat qualities, such as favored food types, as those species pass them by. But they also can’t move their ranges too fast if the habitat conditions they depend on also tend to lag behind climate. Variability in climate warming is likely to affect how species respond, too, La Sorte said. If warming trends weaken, as they did over the past few years, birds may be able to catch up. But accelerated warming, which is likely as global carbon emissions continue to increase, may put additional strain on birds. The study highlights these challenges and the high potential climate change has for disrupting natural systems. It also underscores the challenges ecologists face in predicting the long-term consequences of climate change for many species simultaneously. 3 Comments on "Climate Change Moving Faster than Bird Migration"
Birds are the most mobile.. but their food source isnt as mobile..
One of the reasons, or the major reason birds migrate is to connect with an abundance of food.. not just to go on vacation. 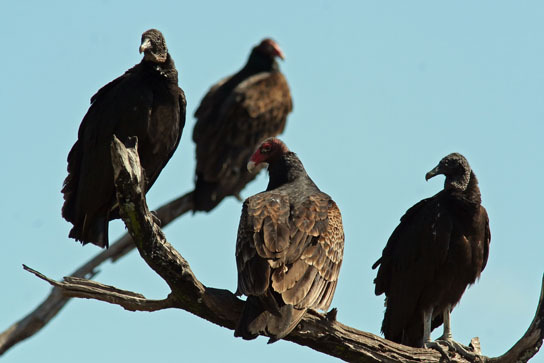 Those birds that are carnivorous, as the black vultures surely are, would be surely affected. Do you think this was considered by the researchers? I re-read the item, and the prey base/food source was covered.